I am, at heart, a bit of a loner. That’s not to say I don’t enjoy a good friendship or gathering or love my people or crave connection. But, it’s true, if I were banished to a desert island somewhere, upon receiving the news I would happily get up, say a little too cheerfully “Really?” and run to pack my things. I don’t mind alone time is all I’m saying. In fact, when I used to read about someone sentenced to jail time (or even solitary confinement) I felt a teensy bit jealous of all that quality time & mused “Eh…that wouldn’t be so bad…especially if I had my own cell” (sharing a cell? Not so much). 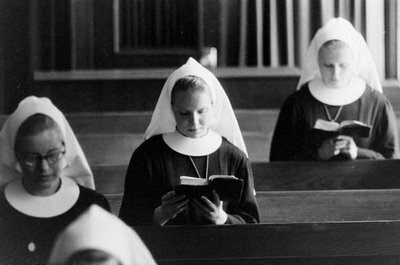 In another place (and religion) I might have been well suited to the nunnery. I trace this back to when I became a mother. For example. When I was about to turn 30, G asked what my heart’s desire would be. I knew exactly what I wanted but I hemmed and hawed a bit before he got it out of me (I didn’t want to hurt his feelings!). What I really wanted more than any thing on earth was a weekend by myself. Keep in mind that at the time I had three kids under the age of five and a traveling, working-overtime husband. I didn’t want any demands or agendas, not even a romantic weekend with my husband. Just me, a stack of books, and 36 hours of my own free will and choice. G (knowing me as he does) didn’t blink twice, just cleared his schedule and carried my bags to the car, waving as I headed south to an inn in rural Virginia. I slept in, stayed up late, walked, took long drives around horse country, readreadread, and wrote pages and pages. I wanted to figure myself out a bit, this new 30 version of me. Nowadays I get my fill of me, of aloneness. The kids are all gone during the day and now I miss having a little buddy tagging along with me. Lately—probably because I’m past the high-intensity early years of mommying with those constant needs, full body contact, and sticky hands, beloved but constant—I’m going back to my more social roots (my parents attest that I was a very social girl!). My 40th birthday happens this year and I'm finding that my dream of an ideal celebration has changed over the last ten years. Now I’m dreaming of a getaway with a gaggle of people, much loud laughter and breezy conversation. With some quiet alone time built into the schedule, of course. 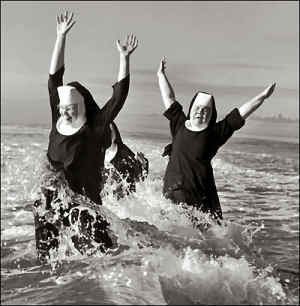 Do you know of any nunneries that host that kind of weekend? Or maybe the lovely island of Alcatraz, with its private suites and city views? Tagged with alternate realities, musing, quirks.